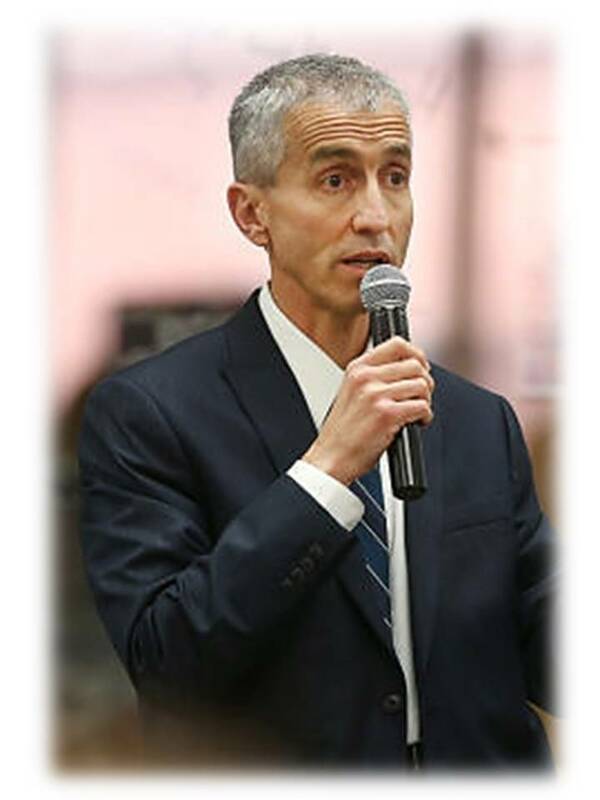 Dr. Manuel Valenzuela, Superintendent of the Sahuarita Unified School District (SUSD), now in his seventh year as district Superintendent, oversees the education of 6,300 students in the rapidly growing K-12 district. Dr. Valenzuela’s talk on September 26 will focus on issues and solutions in the on-going struggle to provide the students in the Sahuarita Unified School District with the best skills for success. He will talk about emerging issues and provide details about local challenges. The program will begin at 6:30 p.m. and is open to all members of TWOQC and to first time guests. Members are encouraged to arrive early to make reservations for the Club’s October Membership Luncheon. Tickets for the October 31 luncheon are $10 for members and $20 for guests. Thanks to all who brought donations for the homeless and hospitalized veterans to the program on August 29. Eighteen pairs of reading glasses, toiletries weighing 30.4 lbs., 59 calendars and 8 lbs. of notecards were delivered to the VA on this week. Come to the Tucson airport September 17 by 5:30 a.m. to see the veterans off at the Southwest Airlines area and/or welcome them home Monday, Sept. 19 at 8:00 p.m. This is a very emotional and patriotic opportunity. The September Honor Flight flyer can be accessed by clicking this LINK. Coupons for the National Guard should expire September 18 or later. Coupons destined for overseas should expire July 1 or later. Coupons may be dropped off at Judy Poffenbarger’s (2390 E Bluejay Bluff Lane) or Peggy Richmond’s (2731 E. Eba Court) at any time. Both have a box by their front doors. Coupons for the Naval Base in Sasebo, Japan for August totaled: $6,248. And coupons for England totaled: $9,582.90. With our cooler mornings and evenings, as you start to dig out your fall clothing, please consider donating anything you and/or your spouse no longer need/want to our clothing drive on October 15 from 9 a.m. to 11 a.m. Items must be cleaned and in good repair. Socks and underwear must be new. Because there are no women in the VA Homeless program who wear size small or medium, any women’s clothing in those sizes will be donated to Genesis House for victims of domestic violence or Youth on Their Own (YOTO) for homeless teens in the local area. Please keep these sizes separated from your other donations if possible. We will be signing up volunteers to help with the clothing drive at our September 26 program. If you won’t be at the program, please contact Laura Colbert at 625-4033 to sign up. We could definitely use some male volunteers for the heavier boxes and bags. Thanks to all who have donated boxes. We now have all we need. We are in need of someone to play background music on the piano before and during our Fashion Show for cancer research on February 24. If you can help, please contact Carol Shelton at tubaccarol@aol.com or 398-3261. This year’s program will feature Heather Rowe, nighttime TV news anchor for KOLD, Channel 13. Ms. Rowe’s remarks will be preceded by lunch. There will be a no-host bar opening at 10:30. The initial program and lunch will begin at 11:00 in the Madera Clubhouse ballroom. 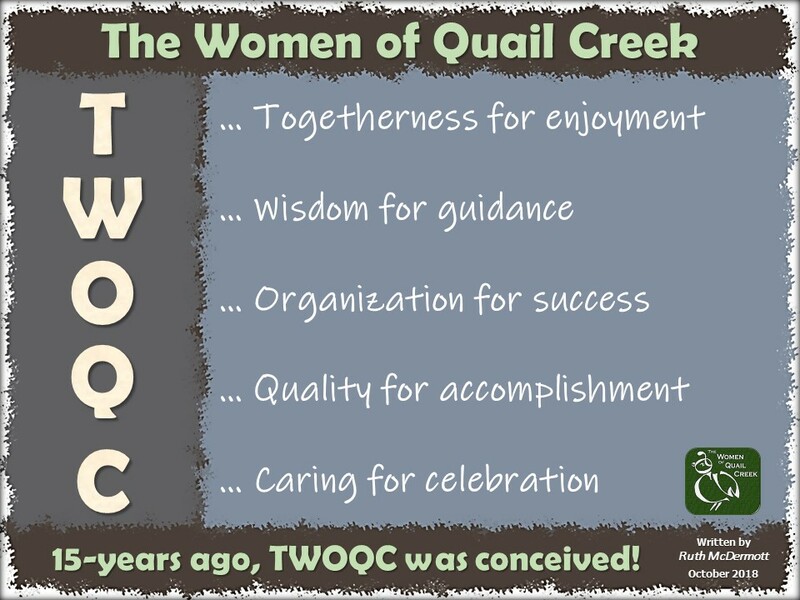 This entry was posted in Announcements and tagged quail creek country club, twoqc facebook. Bookmark the permalink.